Is Google Outsmarting Apple in the Mobile Market? 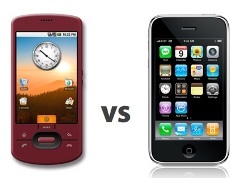 Is Google outsmarting Apple in the highly competitive mobile market? Let me jump right in with a comparison of business models. On one hand, you have a company fixated on a particular device – on the other, a company focused on an operating system built for an unlimited number of devices. And between the two, there is a huge difference in strategic positioning within the mobile market. The business model of Android is, in my opinion, the same model that Bill Gates had when he launched Windows. Gates didn’t just want to build a computer, he wanted to build a system that can run an unlimited number of computers, stretch across multiple computer manufacturers, and be the cornerstone for an entire industry. The same strategy seems to be unfolding with Android. Google didn’t want to just build a mobile phone, they wanted to redefine mobile technology that goes far beyond a phone. Google figured, much like Bill Gates, that it would be much more profitable to build a system that many devices can run on, rather than focusing on just one device. I use the term Apple Mobile because I believe that Apple has evolved into more than just a computer hardware and software company – they have truly become a mobile market leader… wouldn’t you agree? Of course Apple still builds computers, hardware, software, etc… but they are one of the leaders and innovators in the mobile market space. However, Apple’s business model appears to be singular and at the device level. Is this bad? I don’t think so. Obviously the iPhone has been a huge global success and the upcoming iPad seems to be on a similar track. But it’s the strategy of being singular – focusing on one product at a time – that puts Apple at a disadvantage in the mobile market space. Google has gained the strategic upper hand over Apple by building a mobile operating system, and not just a device. Apple’s focus has been on a product. And because of their “product oriented strategies”, I believe they are inferior to Google in the mobile market space. The reason being is that Google has built a system that goes far beyond just one mobile phone or device. The Android OS is being explored on everything from tablet PC’s, to running automobiles. It’s because of this “let’s build a system” concept that puts Google in a far more superior position than Apple in the mobile market space. Apple is continuing to fixate on a single product, while Google is focusing on building a system that an entire market can develop upon. I think you're right to an extent, Google's holistic approach means that they will have a tighter grip on the market; however I think the fan base that Apple has means that it will always have a strong position. Consider the iPad, like you said it's a single focused strategy but it's already sold out and will have a strong market presence. In June Apple will be releasing their 4G iPhone and will probably sell out as well. I think Apple will be with us for the near future at least.